I like to call this the Benji-pult. With special appearance by Reed Richards's torso. Thanks for lookin'! Love it... great work as always, sir. Oh man, absolutely wonderful! You can just hear the "It's clobberin' tiiiiiiiiiiiiiii..." as he flies off into the distance. The FF version of the Fastball Special: first and best, too. I was really hoping it was John Carpenter's The Thing. But that's okay nonetheless. Stellar work as usual. This is AWESOME, Chris! 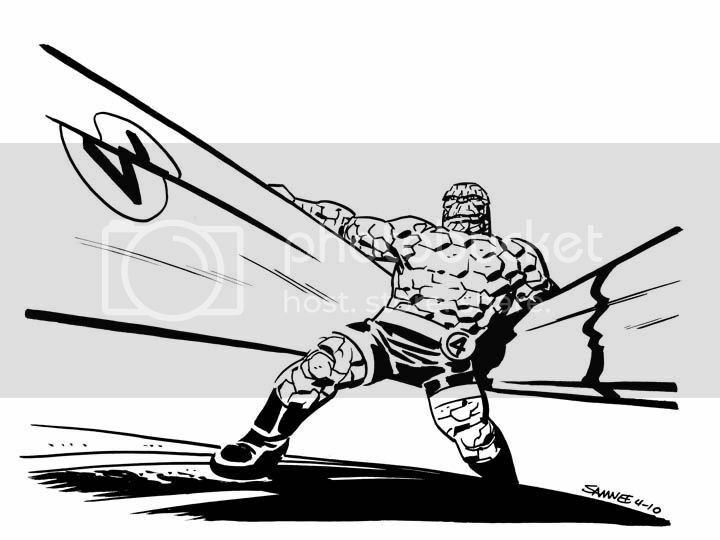 This was always one of my favorite parts of the comics, the FF version of the fastball special. Thing looks great, I love the way you inked the rocks. Another great idea. And it's purty to look at too! That is a beautiful Thing, Chris. Love the feel of it. I'm getting a Kirby/Sinnott vibe off it. This is great. You really captured the wrestling era of Thing's career. I can see him and Reed fighting the tag team of Wizard and Absorbing Man. Please tell me that the FF will make an appearance in your upcoming Thor book, Chris! More!